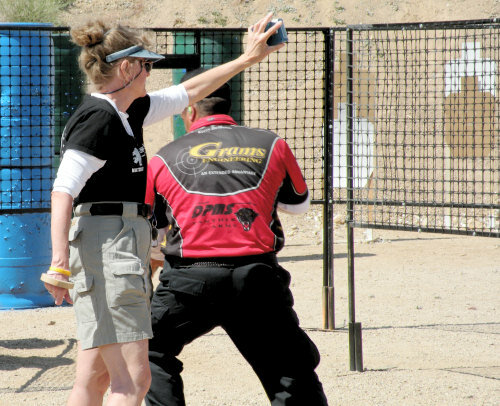 We’ve talked about what the IDPA Classifier is, now let’s talk about how to shoot it well. This is my scoresheet from the last Classifier I shot. I really wanted to make Sharpshooter in Stock Service Pistol (SSP) Division with this classifier, but I fell short. Fortunately for me, I know why I didn’t make it and what I need to do to improve. For the past few years, I’ve had a practice regimen that is more about developing my skills overall, so this is the first time I’ve had to practice with a specific goal in mind. If you guessed “Stage Three”, you’re right! Stage Three is all about making longer-range shots from 20 and 15 yards, and it’s the only part of the Classifier where you’re shooting around cover. So not only are you making longer shots, you’re making them from positions that are more awkward than the other parts of the course of fire. Breaking it down, with one exception, (a missed headshot on my third shot on Stage One), the first two stages are, in my opinion, an accurate reflection of my current shooting skill, so there’s not a lot of room for improvement there. However, I know I can shoot Stage Three better than I did, because I have. For starters, I concentrated on the wrong thing. I’ve been shooting a fair amount of USPSA as of late, and the rules for changing the magazines in your gun in that sport are different than they are in IDPA. In USPSA, it’s perfectly ok to let a partially-full magazine hit the ground, in IDPA, that’s cause for a 10 point procedural penalty. As I was preparing myself for the stage, I was worrying about my reload, not concentrating on slowing down and making sure I got my shots. Secondly, I rushed my shots. While I took more time for each shot than I did in the other two Stages, the fact is, it wasn’t enough: I could have slowed down even more and made doubly sure that my sight alignment and trigger press were there for each shot, but instead, I rushed things a bit and paid the price for my haste. Whoops. Let’s break down my breakdown on Stage Three even more. * Time remaining is the time I have (before penalties) to complete the Classifier in order to have a score that will push me into Sharpshooter. 61 points down on that stage includes five missed shots, and at 10 penalty points per shot, that translates into 25 seconds taken off my score. Had I made those shots, that would have put me at 130 seconds for the course of fire and into Sharpshooter. Hence my problem. I have to balance the speed of my shots with the accuracy of those shots so I come to a balance where I can do better on that last stage. I shot it in 49.03 seconds, and I don’t think there’s much room for improvement right now with my movement speed between the barricades or getting my gun out of my holster quickly, so any improving my score has to come from improving my shot accuracy. What this means is that 49 seconds is my par time for practices this stage, and the 15.2 seconds of remaining time translates into 30 max penalty points I can possibly have on Stage Three in order for me to make Sharpshooter. This really should not be a problem, as that’s three times the points down I had on Stage Two. Fortunately, I know how fast I shot each string of fire on Stage Three, so that gives me a par time that I can use in my practice sessions, and the 15 seconds time remaining tells me how accurate I need to shoot to make Sharpshooter. Breaking it down, here’s what my practice drills will need to in order to make everything work. Intimidating, but I know I can turn and shoot three targets clean at 10 yards in under 11 seconds with a reload, so shooting it at 20 yards in under 19 seconds should not be a problem. As with just about everything in practical shooting, I can do what’s required to be successful, all I need to do is do it on demand while the timer is running. And that’s the hard part. It’s been about a year and a half since I dove head first into the world of competitive shooting, and while I’m making some progress with my speed and accuracy, there’s something holding me back, and I can’t seem to shake it. I’m no stranger to the stress, anxiety and pressure present when participating in sports (especially since my nature is to be ridiculously competitive), but there is an element of practical pistol shooting that I have never experienced before, and it’s making me look like more like Jerry Lewis than Jerry Miculek when I’m shooting a match. Some call it the Red Mist. My better half has referred to it as bezerker. It is an indiscriminatory and unrelenting force that is laser-focused on sabotaging your performance. Ridiculously clever and devious, it will allow you to build up your confidence just until you step up to the line and into the shooting box. And then the timer goes *beep*, the red mist appears, and all careful planning and strategy disappears as if it never even existed. If you’ve been watching Top Shot on the History Channel, you may have noticed that the Red Mist makes a cameo appearance in almost every episode. During episode two of season 3, it appeared during the elimination challenge and prematurely knocked my favorite contestant and WOMA home girl, Sara Ahrens, out of the competition. Yep, that’s the unmistakable mark of the red mist. It doesn’t just effect your performance on the range, it also leaves a trail of amnesia and dumbfoundedness in its wake, making it that much more difficult to overcome. So, is it possible to defeat the Red Mist, and if so, what’s the secret? Watching shooting greats like the Leatham’s and the Miculek’s make it pretty darn obvious that it can be overcome, but how does a mere mortal like me fend off this unwelcome creature that has the power to take over my brain at will? It’s the preparation I do BEFORE I even step on the range that helps me with that. At this particular stage, though, I told myself to take your time and get through it. Don’t rush it, stay focused, and be patient with myself and the trigger. Basically a mental talk off the ledge. Once the buzzer goes off, instinct kicks in as well. Experience helps a lot, you’ll get there. Mental strength is also a BIG part of this game. And if all else fails….breathe! Looks like I’ve got some dues to pay to the Red Mist. If you’re looking for me, check the local ranges. I’ll be the one trying to reload my left thumb into the magazine well.